Have Twins turned outfield defense from strength into potential weakness? An outfield that had amazing defensive potential before Aaron Hicks was traded now feels like on some nights it will be merely OK -- or worse. Video (04:58) : Buxton, Park and Sano are among those to watch as the twins begin their 34-game exhibition schedule. Eddie Rosario in left field, Byron Buxton in center field, Aaron Hicks in right field. All three can cover a ton of ground and throw. They were a pitcher’s dream. We saw that lineup for exactly four games in 2015, all of them in September, all between the 5th and the 15th. We won’t see it again, with Hicks traded in the offseason. The ground they covered in that brief time was stark in comparison to 2014, when the lumbering likes of Chris Parmelee, Chris Colabello, Oswaldo Arcia and Josh Willingham still patrolled the outfield much of the time while an out-of-position Danny Santana learned on the fly because Hicks wasn’t ready yet at the plate. It was also stark compared to watching Torii Hunter work right field for much of 2015. For all Hunter offered to last year’s Twins, his defense was below par. Looking at FanGraphs and the stat defensive runs saved above average Parmelee, Colabello, Arcia and Willingham were a combined minus-29 in 2014. Hunter was a minus-8 in 2015. Rosario, Hicks and Buxton — even though none played full seasons — were a combined plus-16 in 2015. But what could have been a real strength in 2016 instead now looks like a question mark because of the direction the Twins went in the offseason and the candidates vying for roster spots this year. Hicks, of course, was traded to the Yankees. You have to give up something to get something, and the Twins needed a long-term answer at catcher. There’s no begrudging the desire to upgrade with John Ryan Murphy, but it came with a price. The price was sacrificing what could have been a great outfield. Had, say, Trevor Plouffe been traded for a catcher while Miguel Sano moved to third, it would still be intact. Plouffe has turned into a good defensive third baseman, but he was better defensively (at least according to FanGraphs) two years ago than he was last year. 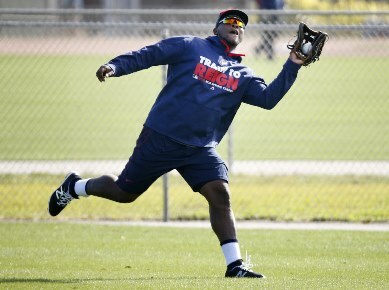 Sano might prove to be OK in the outfield. My guess, though, is that “OK” still translates to far less than what Hicks would have provided in right field. If Arcia rebounds and starts hitting, he could also see time back in the outfield. In 2014, he was a minus-10 in defensive runs saved. Santana could be a stopgap if Buxton isn’t ready. Rosario — who was excellent last year in the field, particularly with his arm — figures to be a constant. Maybe if Buxton sticks and Rosario keeps playing regularly, they will cover enough ground to make up for whatever range Sano lacks. Big-picture, this at least shouldn’t be a return to the lumbering days of 2014. But an outfield that had amazing defensive potential now feels like on some nights it will be merely OK or worse. It will be interesting to see how that impacts the 2016 Twins and a group of pitchers that still doesn’t figure to strike out a lot of batters.